MacVector 11.1 is now available for download by qualified customers. To run MacVector 11.1, you must have a maintenance contract with MacVector Inc that was active on December 1st 2009, or have purchased an upgrade since that time. Please also note that MacVector 11 requires Mac OS X 10.4 or later. 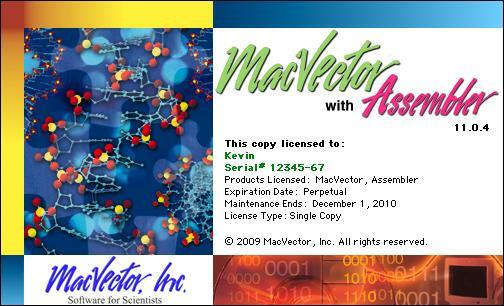 If your "Maintenance Ends:" date reads December 1, 2009 or later, you will be able to run MacVector 11.1. If not, you can register to download the trial version, then contact your local MacVector account manager (sales@macvector.com) to learn about upgrade options. All customers who are eligible to run MacVector 11.1 should use this link to download the MacVector 11.1.2 updater. MacVector 17 has a huge number of new features including support for macOS Mojave Dark Mode, Gibson/LIC Assembly+Design, a new Restriction Enzyme picker, comprehensive whole genome feature comparison, and a slew of other major enhancements. Read about the new functionality here and determine your eligibility for a free update here. The full installer is available to download on this page. MacVector 17 is not only fully supported and compatible with Apple's latest OS release, macOS Mojave, but it also supports the new Mojave Dark Mode. Earlier versions of MacVector can't do this. So why not upgrade? There is a new release of MacVector with enhanced automatic sequence annotation, a simplified combined Feature/Symbol Editor, a new Assembler algorithm (SPAdes) and lots of other improvements. Read about the new functionality here and determine your eligibility for a free update here. The full installer is available to download on this page. This release adds support for more flexible automatic online updating. This will be a required update in preparation for our forthcoming MacVector 16.0 release. Download the update here. Check out this link for a list of the new features introduced in each version going all of the way back to MacVector 10.0. There is a new cost-effective version of MacVector available, targeted at users who want the power of MacVector's graphical annotation, clone construction and primer design tools, but without all of the bells and whistles of the full version. Click here for details of the new Cloning Edition. Which edition is right for you? Here's a handy functional comparison chart. There's a useful Getting Started Guide to help new users get going with MacVector. We have a blog with contributions from a selection of MacVector, Inc staff discussing a variety of subjects from OS X through bioinformatics, to the challenges of running a small multi-national company.